James Fuller, 28, was in a meeting at work in Canary Wharf one Monday when he collapsed. He had suffered a cardiac arrest. An ambulance was called immediately, along with the trained first aid rep in the office. One of James’ colleagues, who had learnt basic life support at school, started giving cardiopulmonary resuscitation (CPR) to him as soon as he stopped breathing, while taking additional advice over the telephone from the ambulance call taker. Within minutes Motorcycle Paramedic Steve Milsom, fast response car Paramedic Sarah Fanshawe, cycle Paramedic Pete Evans and ambulance crew Michael Casizzi and Carol Summers were on the scene. The ambulance staff gave James two shocks with a defibrillator and his heartbeat returned. He was taken to hospital and discharged a few weeks later with an internal cardioverter defibrillator fitted. He is now working again. James said: “I never could have anticipated that I would have had a cardiac arrest at 27 – I was an active, relatively healthy person, and it came completely out of the blue. Thanks to the quick reactions of my work colleagues, I was kept alive until the ambulance staff could arrive on the scene. 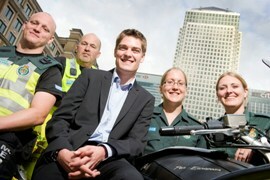 I’m forever indebted to my work colleagues for what they did, as well as to the ambulance staff.